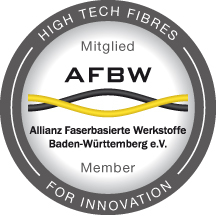 LACOM is now a member of AFBW (Alliance fiber-based materials Baden-Württemberg). The AFBW combines science and business, people and markets, technologies and fields of application – from the fiber to the finished product. Know-how transfer is their most important task. They create added value in order to stimulate innovation and drive innovation. The aim of this work is to promote the competitiveness of companies, universities and research institutes in the region. AFBW is the first nationwide network in the South West, which has been awarded the Baden-Württemberg and the European cluster label. With our professional management, we are one of the 30 most powerful networks in Europe.